As you may or may not know, my next book is about my high school experience. I'd like to think that my experience was a little different than the average. 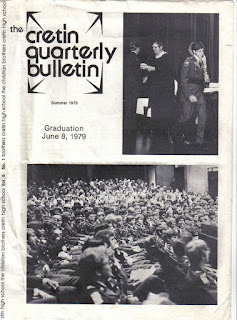 I went to an all male, Christian, military academy in the late '70s. For those who know, the school is Cretin High which merged with the girls school, Derham Hall, became military optional and was renamed to Cretin Derham Hall. When I first started to think about what I should write about after The Portland House, my unique high school experience was the first thing to come to mind. I started putting ideas down and as I took them to class/workshop every week, they were well received. This was reassuring as I wasn't sure the strange parameters (male/Christian/military) were enough to carry the story, but found out that my days as a student were filled with just enough boneheaded stories to keep the reader's interest. But what I've discovered in the process is the teenage high school experience is almost timeless when it comes to peoples' ability to relate. We all are awkward gawky teens, we all learn to drive, we all try and act older than we are and many of us skate at the edge of lawlessness during our teens. These things come along with the undeveloped frontal lobe, whether we like it or not. So when I brought in a story to writing workshop this week about me and a couple of friends taking a 1970's vintage pedicar for a spin, I thought the piece was just average. But judging from the reaction of the class, it was more than that. In fact, it was the reaction of the class that re-energized me and got me excited about the book. We writers need a fair amount of stroking, even if it is among our own, and Monday provided that. I'd say this is about spot on. Right now I'm at point number 4, so I'm happy for the moment.